This month, Beacon Hill Partners is excited to host a forum on social media for fan engagement. If you’re starting a new venture or energizing an old one, online fan engagement can make or break your marketing efforts. Are you emotionally connecting with your fans? Are you meeting them at the times and on the platforms where they want to hear from you? Are you retaining, engaging and converting your fans in to customers? 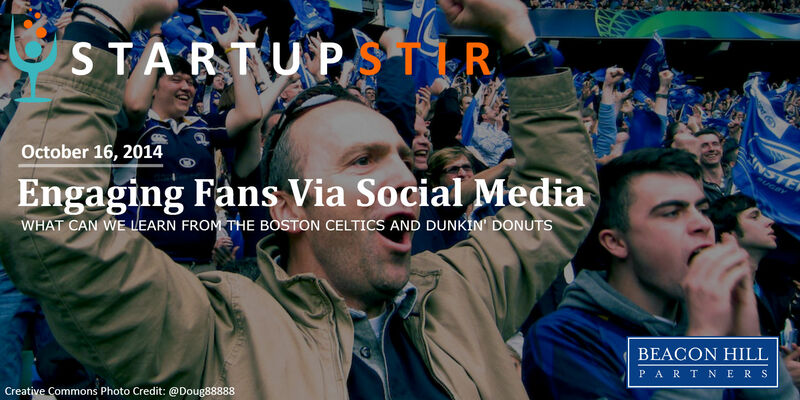 To get to the bottom of this, we’ve assembled an expert panel of social media gurus from Dunkin Donuts, the Boston Celtics, area ad agencies and more. Best of all, Startup Stir is an excellent networking event with complimentary cocktails sponsored by Boston cocktail caterer Revolution Cocktails. This is an event you won’t want to miss!